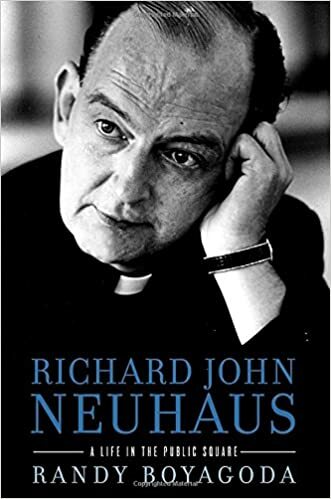 A new biography, Richard John Neuhaus: A Life in the Public Square by Randy Boyagoda, does quadruple duty. It provides a well-researched and documented critical look at the life and work of Neuhaus, in the context of US history, including sociological trends, from the 1960’s through the early 2000’s, societal pressures on and changes in the role of the Church in public life, and the continuing struggle over unresolved Reformation issues among and within Catholic and Protestant bodies. It is a great read. The image of Neuhaus based on the biography and on his quotes therein is of a bigger-than-life, somewhat rude, impatient, and outspoken man who loved bourbon and cigars and didn’t hesitate to consume even the cigars in a friend’s living room. However, watching him speak on one of the many YouTube videos available (example), he comes across as a loving pastor serving God and neighbor. Well, I suppose that too is a bigger-than-life image. You can download the book to your Kindle or iPad here. do write in my journal daily. I’d like to start a blog so I can easily share my personal experience and views online.